MOORESVILLE, N.C., Feb. 22, 2018 /PRNewswire/ — Today, Lowe’s Companies, Inc. (NYSE: LOW) announced Track to the Trades, a new workforce development initiative that aims to provide innovative career alternatives and financial support for employees to pursue a skilled trade. The program will be supported in partnership with Guild Education, an adult education company. The initiative comes at a time when the skilled trade industry is experiencing a rapidly declining workforce. According to the Home Improvement Research Institute, more than 60 percent of skilled trade professionals agree that there is a shortage of labor in the construction industry. The same study reports ongoing hiring challenges for professional contractors, with 40 percent of pros looking to expand their job site workforce. Beginning March 1, Lowe’s will debut Track to the Trades in four cities: Charlotte, Denver, Pittsburgh and Richmond. 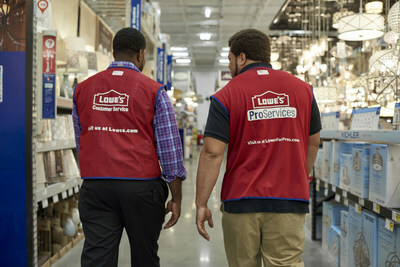 Following the four-city pilot, the program will be expanded to qualified Lowe’s part-time and full-time employee nationwide by the end of 2018. The U.S. Bureau of Labor Statistics (BLS) reports that the nation’s need for workers in the skilled trades is increasing much faster than the growth of employment overall, according to a recent forecast. In fact, Lowe’s analysis of BLS data projects we will experience a skilled trades gap of more than a half million jobs across construction-related fields by 2026. Lowe’s Track to the Trades program is a first step toward rebuilding the skilled trades workforce and infusing pride back into trade professions that are vital to society. Guild Education is transforming the way employers offer Education as a Benefit to their employees. Guild Education’s platform makes offering education benefits an easy choice for leading companies, with a platform to help innovative HR leaders turn their education programs into a long-term positive ROI for their company. The company’s diverse network of online, nonprofit universities offer a range of programs from GEDs and apprenticeship programs through bachelor’s and master’s degrees, along with advising and retention coaching to help each student navigate the worlds of work and post-secondary education. As of today, Guild Education has raised a total of $31.5 million in funding from Bessemer Ventures, Redpoint Ventures, Harrison Metal, and Cowboy Ventures. To learn more about Guild Education, visit www.GuildEducation.com.